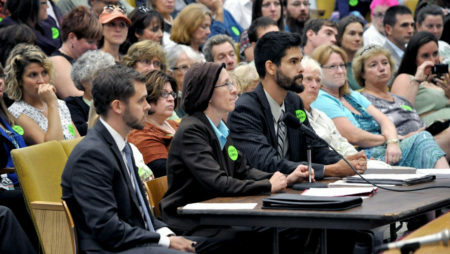 Organizing by NOFA/Mass in 2005 and 2006 helped to pass local resolutions in 30 Massachusetts towns and cities calling for mandatory GMO labeling. Seeing the local demand in her district that included Amherst, Representative Ellen Story started introducing a GMO labeling bill each year in the state legislature. Support, however, was small until in 2012 a highly contested state ballot initiative in California caught the attention of food activists, farmers and parents across the country. During that summer the NOFA Summer Conference, not coincidentally, featured the popular anti-GMO author and lecturer Jeffrey Smith, who delivered the keynote and facilitated a preconference communications training. It was here that MA Right to Know GMOs, a single issue action group, formed. That group, with NOFA/Mass, MASSPIRG and MoveOn.org, built a broader coalition of nearly 500 community groups, environmental organizations, farms and local businesses expressing support for GMO labeling. By the time the 2015-16 bill was released from committee, it had more than 75% of the state legislators as cosponsors. Many reported it was the #1 issue they were hearing about. As the end of the legislative session approached, excitement was also building in neighboring Vermont, which was about to enact its own GMO labeling law (July 2016). By this time more than 20 other states had introduced similar legislation and it felt like Massachusetts could be the next to pass. Late in July, only weeks after Vermont’s law went into effect, Congress passed an industry-sponsored law that pre-empted state level labels. Vermont’s law was null, the Massachusetts GMO Labeling bill was dead. Despite this, many people learned about the existence of GMOs in our food and try to avoid them. Voluntary “non-GMO” labels are now quite a common selling point and the USDA is charged with coming up with some sort of GMO label sometime soon. Here are a few lessons learned about coalitions from that experience. Each core group had relatively distinct constituencies: the farmers and gardeners, the consumer advocates, the liberal activists. It’s important for legislators to hear from a diversity of demographics, so this was a strength of the campaign. Communications: Establish regular communication systems such as weekly calls among the core. Communicate updates and breaking information as needed, first to core then immediately to partners. Decisions: Aspire to consensus, but only when necessary (ie. for joint statements or synchronized timing of actions, etc). It never came down to a vote for us, but we had established that in such a case, each group in the core would have one vote, so three out of four would be needed to proceed. I think work-ing toward consensus is the right approach. Keeping the group small makes it possible. Generally, promote autonomy. But be clear about “red lines,” i.e. what NOT to say or do. A partner group suggested putting labeling on the bal-lot, but we thought our chances were better for legislation and a ballot question would allow legislators to bypass the pressure we were generating. So partners couldn’t support the ballot route as well. Money: Be clear about finances. Our coalition did not have a shared budget, each organization had to leverage its own resources. Fortunately the fiscal sponsor for MA Right to Know GMOs was a 501c4 and because of the national interest was able to secure us funding for a lobbyist and PR firm. These two elements were of critical importance in the later stages of the campaign. Don’t avoid hiring professionals to negotiate the tricky waters when you get close to a win. There are some sharks out there who know the waters and will fight you seriously at that point.